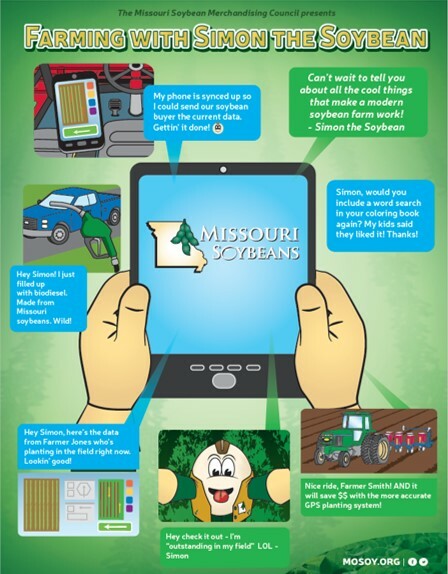 For individuals wanting to learn more about how Missouri’s top crop is grown and used, the Missouri Soybean Merchandising Council and soybean checkoff work to make resources available – ranging from kids activities to one-on-one conversations for parents making food choices for their families. Elementary-school aged children will enjoy a broad range of activities in the Missouri Soybean Merchandising Council’s annual activity book. Featuring Simon the Soybean, the book includes coloring pages, fact sheets, puzzles and other games showing how soybeans are grown and how they’re used to make household items families use every day. Check out the 2019 Book, as well as our 2016, 2017 and 2018 editions. All three books are available for download and individuals and community groups are welcome to make copies of the books or pages for use throughout the year. Each winter, Missouri Soybean also works with Missouri FFA chapters to bring the activity books into classrooms during National FFA Week. CommonGround™, a partnership between the United Soybean Board and the National Corn Growers Association, is a national program aimed at creating a unified voice for modern agriculture. Funded directly by farmers through their checkoff programs, CommonGround is an effort to show how farm families work to produce the safe, wholesome food supply we enjoy. Missouri farm women volunteer their time to be a part of this grassroots program. Volunteers share their personal stories and demonstrate the similarities of real farm families and the consumers who benefit from what farmers grow. Interested in learning more about the CommonGround program? 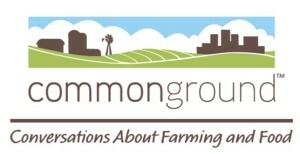 Visit findourcommonground.com to meet Missouri’s farm women and sign up for the program newsletter. Agriculture Education on the Move is an educational program available across Missouri through Missouri Farmers Care. Missouri Farmers Care is a joint effort by Missouri’s farming and agriculture community to stand together for the men and women who provide the food and jobs on which our community depends. Missouri Farmers Care implements activities to promote the continued growth of Missouri agriculture and rural communities through coordinated communication, education and advocacy. Visit www.MoFarmersCare.com for more information. Ag Education on the Move began as an educational effort by the Missouri Soybean Merchandising Council (MSMC) and the soy checkoff. In 2011, MSMC saw a need for hands-on agriculture education and committed its resources to build a program that took agriculture education into elementary school classrooms. From that initial commitment, the program grew. By 2015, the program had grown to represent all of Missouri agriculture, and MSMC and Missouri Farmers Care came together on a plan that would support even more growth going forward. Today, the program has 26 educators volunteering in Missouri schools and has connected with more than 47,000 students and their families across Missouri.